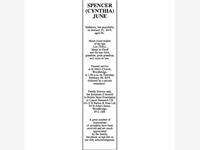 SPENCER (CYNTHIA) JUNE Suddenly, but peacefully, on January 23, 2019, aged 94. 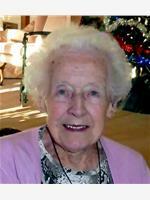 Much loved widow of the late Len (Tiffy), ‘Mum&apos; to Geoff and the late John, grandma, great grandma, and mum-in-law. 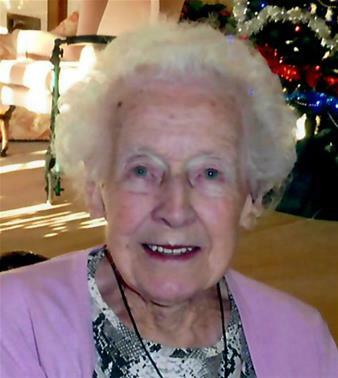 Funeral service at St John&apos;s Church, Woodbridge, at 1.00 p.m, on Thursday, February 28, 2019, followed by a private cremation. Family flowers only, but donations if desired to British Heart Foundation or Cancer Research UK c/o. E B Button & Sons Ltd, 24 St John&apos;s Street, Woodbridge. IP12 1EB. 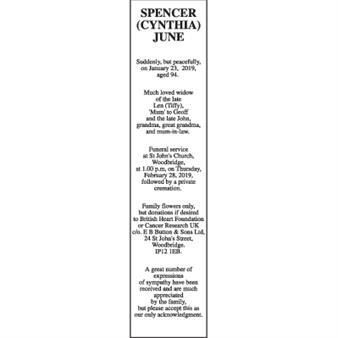 A great number of expressions of sympathy have been received and are much appreciated by the family, but please accept this as our only acknowledgment.